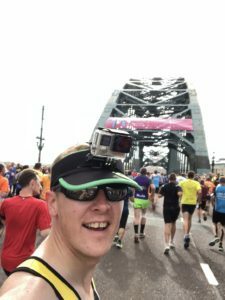 The Great North Run was my first big goal in 2009 when I started running, and 2018 would be my sixth time running from Newcastle to South Shields. 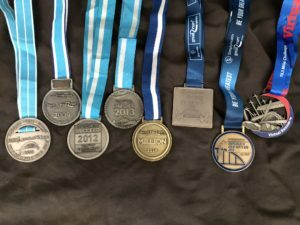 It’s fair to say this race has a lot of history, and it’s also heavily connected to my own running journey. So what is it that makes me drive 5 hours each way again and again? What keeps me going back to the North East? Let’s start by saying this race is pretty expensive when you compare it to the price of others. I’d say £30 is about the average going rate for a half marathon but the Great North Run is about £55. You also have to ballot to get in and you might wonder why in excess of 57,000 people are balloting to pay for an expensive race? If you’ve never been before you wouldn’t know the answer but if you’re travelling up for the race I’d advise getting there on Friday Night and you’ll reap the rewards of the whole race weekend. Firstly you can wake up on Saturday Morning and if you want to do parkrun then there’s plenty to pick from. The big one is Newcastle parkrun on the huge park which is directly next to the Great North Run Start. It’s a great opportunity to familiarise yourself with the area ready for the big day and there’s always a massive turnout with many GNR runners in attendance from all over the UK. There were plenty of tourist apricot shirts in attendance. 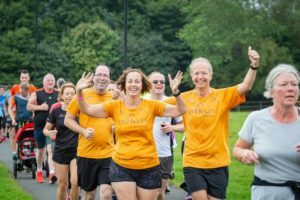 If you don’t fancy the big parkrun the North East has loads to choose from in the area from Gateshead and Windy Nook to Rising Sun and Gibside. Usually South Shields parkrun us cancelled on GNR weekend as the set up is going on for the GNR finish. Obviously you’ll want a nice hot drink and some breakfast after that (Rising Sun’s Scones are amazing just FYI). However don’t hang round too long because you’ll want to get showered and changed and down to the Quayside for The Great North City Games. The street athletics is incredible. Usually if you go to a stadium, you’ll pay £30 to watch from the stands and be really far away from the action. At the Quayisde it’s free to spectate and you’re so close to the athletes you see all the action up close. Now you’re starting to see some of the value in that pricey entry fee. 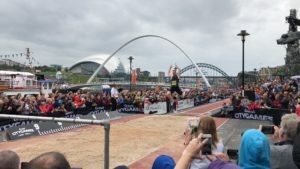 With Long Jump, Pole Vault and track athletics it’s a great way to spend the afternoon and take some photos with the Tyne Bridge as your backdrop bearing the Great North Run Logo. The GNR pasta party is also right next to the games so it’s a great way to fuel up on the free pasta using the tear off ticket attached to your race bib. If you’re up in a group or with a running club it’s then an evening of good food, company and laughs fuelling up on all the carbs ready for the big day. Onto Sunday, the big day! The best way to get to the start line is by the Metro and you need to get to Haymarket Station. It’s £5.10 for a day ticket on the metro to travel everywhere you need for the GNR. 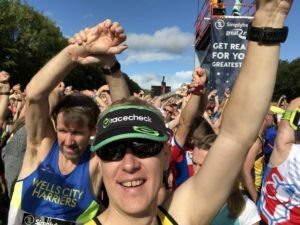 I love been part of the Racecheck #visorclub because it means you never race alone and we always meet up for some photos and banter before the race. 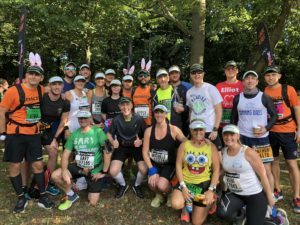 You’d notice a couple of them are in the Duracell Bunny kit being pacers and that gives you a guide for all paces from 01:30 – 2:10 I believe. In 2017 I paced and I must say with 57,000 runner it’s really hard to cater for everyone with pacing in this event. The chances of being in the same pen as the pacer you need are low but if you can find your pacer they are there. Then get involved in the mass warm up. This race has got to have the longest staring zone I’ve ever seen and if you’re nearer to the back you will have a wait before you cross that start but when you do it’s awesome. I find it hard to explain in words, the commentator is amazing and you can see him in the video I made as well as the fun and games of OGGI OGGI OGGI – OI OI OI in the tunnels. After that it’s on to Tyne Bridge. This is an amazing moment in the race, it’s lined with people and they are all cheering. The Red Arrows also fly over the Tyne Bridge and I’ve never managed to nail the timing to be on the Bridge when they fly over, but if you are then when it happens enjoy it. IF you look left you’ll see the Sage and the Gateshead Millenuim Bridge where you enjoyed the City Games the day before. Now after the Tyne Bridge there aren’t really any more big landmarks but there’s plenty of other things going on. You cannot mistake hearing the Blaydon Races being played as you run underneath the underpasses. The Geordie’s are a proud people, this is a big song for them and they belt it out, it’s awesome. There’s plenty of other bands and music spots along the way. Its all dual carriageway and by now the field is thinning out and you have plenty of room to run in. To be fair if it wasn’t such a large road all the way, there’s no way so many could take part. 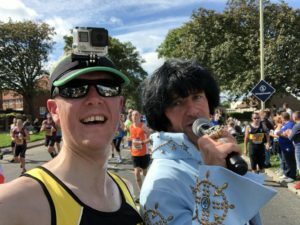 2018 was a hot year and by mile 9 I found a runner collapsed on the road. There were already 2-3 other runners helping him, but there was no one protecting them from the stampede of runners coming down the road. I stopped I became a pop up marshal, I used the cones and ropes at the roadside to make a taper around them and stood there shouting at all the runners to move to their left and avoid the hazard, and keep the guy safe. Now I must say, it really hit me here how many people were wearing headphones, completely bloody oblivious to anything that was going on around them and didn’t hear me shouting repeatedly as they approached. I had to manhandle 2-3 runners around to avoid them clattering into the unwell runner and those assisting him. I honestly don’t understand why people race in headphones. Training alone, yes I get it, it can be boring and music helps but on race day, why wouldn’t you want to soak up that atmosphere but more importantly it’s not safe for exactly this reason. I was here for about 10 minutes until St John’s and a police officer arrived and took over from me. I carried on but this guy was on my mind and I hope he was OK.
And listen if I shouted at you abruptly during this because you wore headphones, I’m not sorry about it, a man’s well being is far more important than you’re need to listen to Taylor Swift. DON’T BE A DINGBAT! DON’T WEAR HEADPHONES! When you get to the end of the John Reid Road there’s a long uphill, it’s not steep but it goes on a bit but a bit of banter with a dude dressed as Donald Trump helped (see the video) A real highlight for me is the Elvis impersonator near the top to motivate you, he’s awesome. Once you crest the hill, there’s a sharp downhill onto the coast then a mile of absolute noise as the people of South Shields are out in force cheering you on to the finish. It’s a long mile, you can see the finish line for almost all of it, beckoning you to glory. The red arrows also fly over South Shields with a death defying display of flying precision to top off the day. Then it’s time to collect your bag and be on your way. I’m not going to lie, it’s a nightmare to get out of South Shields, whether you’re using the bus, or the metro be prepared to queue. Get out of there as fast as you can because as more and more runners finish it only get’s worse. The 2006 medal is my wife’s by the way, she did it before me, and if you’re wondering the one on the right is a virtual medal from Virtual Runner UK. 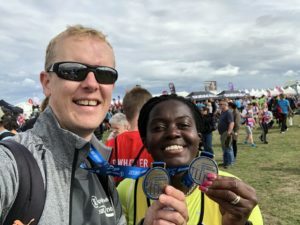 Each year they do the virtual half marathon race on GNR weekend and you can get that medal for £12. 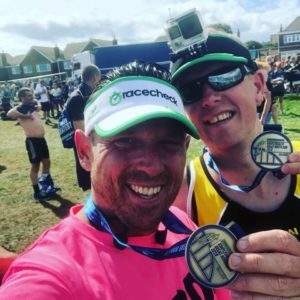 This Virtual Race raises money for charity and if you’re running GNR, it’s a double medal day. 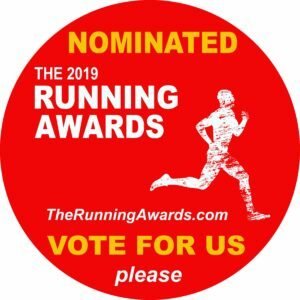 I’ve been nominated for the best blog at the Running Awards 2019 so if you like the content I produce please do click this button and vote for baze187 in the best blog category. Thanks.